The Netgear XAVB1004 is now available for order. Powerline network devices have been growing in popularity. There are still lots of devices, like game consoles, that don’t have wireless. Unless you have a newer home with wired network you need a way to get those devices internet without drilling holes and running cable. The nice part about the Netgear XAVB1004 is that you can connect up to 4 LAN devices to it. MRSP is $180 but you can buy from Amazon for $150 . Only 3 left in stock though so you better hurry. SAN JOSE, Calif. – August 10, 2009 – NETGEAR, Inc. (NASDAQGM: NTGR), a worldwide provider of technologically innovative, branded networking solutions, today announced the availability of its latest powerline networking kit for turning electrical power outlets into high-speed Internet and home network connections. 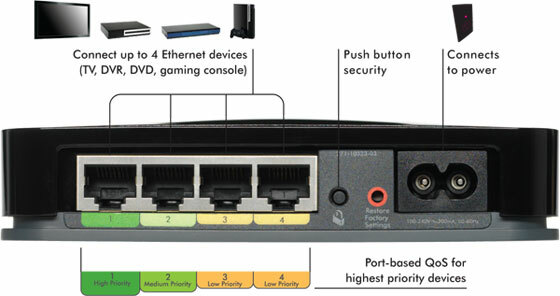 As a 2009 CES Innovations Award winner, NETGEAR’s Home Theater Internet Connection Kit (XAVB1004) makes it possible to connect multiple Ethernet-enabled entertainment devices – such as gaming consoles, Blu-ray players, HDTVs and media streaming set-top boxes – to the Internet and the home network simultaneously. Through a high-speed powerline connection of up to 200 Mbps, this powerline kit enables high-performance applications such as HD video streaming, Voice over IP (VoIP), Internet gaming and large file transfers to networked devices in the home theater. The kit contains one Powerline AV Adapter with 4-port Ethernet Switch (XAV1004) and one Powerline AV Ethernet Adapter (XAV101). This “no new wires” powerline technology enables customers to carry high-speed data network traffic on their existing electrical wiring – using affordable, simple to install adapters. Additionally, advanced energy management capabilities provide automatic port- and device-level sleep modes and wake-on-activity functionality to reduce overall energy usage. The kit also incorporates several ease-of-use features: port-based Quality of Service (QoS) to ensure that the highest priority applications are allocated more bandwidth; Push-N-Secure to secure the Powerline AV network with the push of a button; and Pick-a-Plug, a multi-color LED to determine the strength of the powerline connection without having to look at a computer. NETGEAR’s Home Theater Internet Connection Kit is perfect for anyone who wants to extend their home network range, especially those who use Internet-connected devices that demand high bandwidth, such as NETGEAR’s Digital Entertainer Elite (EVA9150; http://netgear.com/Products/Entertainment/DigitalMediaPlayers/EVA9150.aspx), Blu-ray Disc Players, TiVo, AppleTV, Xbox 360, Sony Playstation 3, DVR, Home Theater PC and Ethernet-enabled TVs. Easy to install, consumers simply plug the Powerline AV Ethernet Adapter (XAV101) into the router and connect up to four Ethernet-ready devices to the Powerline AV Adapter with 4-port Ethernet Switch (XAV1004). The Home Theater Internet Connection Kit eliminates the need to add an external switch for connecting additional devices to the network by integrating a 4-Port Fast Ethernet (10/100) switch. The product is also the first 4-port powerline switch to use the Intellon 6400 chipset, which provides higher performance than any existing 4-port powerline switch on the market. Because it is based on the HomePlug AV standard, the Powerline AV Adapter with 4-Port Ethernet Switch (XAV1004) and Powerline AV Ethernet Adapter (XAV101) are compatible with – and can easily and affordably extend – any existing HomePlug AV network. NETGEAR’s Home Theater Internet Connection Kit (XAVB1004) is now available worldwide through leading retailers, e-commerce sites and value-added resellers. The kit is backed by a one-year warranty and 24/7 technical support. The Home Theater Internet Connection Kit (XAVB1004), containing one Powerline AV Adapter with Ethernet Switch (XAV1004), one Powerline AV Ethernet Adapter (XAV101), two Ethernet cables, one AC power cord, an installation guide and a set-up CD, has an MSRP in the U.S. of $179.99. Additional NETGEAR Powerline AV devices, including the Powerline AV Ethernet Adapter (XAV101), Powerline AV Adapter with Ethernet Switch (XAV1004), and Powerline AV Ethernet Adapter Kit (XAVB101) – winner of PC Magazine’s Editor’s Choice Award – can extend an existing Powerline AV network and have an MSRP in the U.S. of $69.99, $99.99, and $149.99 respectively. Photos and other product information can be found on the NETGEAR web site at http://www.netgear.com/Products/PowerlineNetworking/PowerlineEthernetAdapters/XAVB1004.aspx. For a fun look at the evolution of gaming featuring NETGEAR powerline, visit http://www.agamer4life.com. NETGEAR (NASDAQGM: NTGR) designs innovative, branded technology solutions that address the specific networking, storage, and security needs of Small- to Medium-sized Businesses (SMBs) and home users. The company offers an end-to-end networking product portfolio to enable users to share Internet access, peripherals, files, multimedia content, and applications among multiple computers and other Internet-enabled devices. Products are built on a variety of proven technologies such as wireless, Ethernet and powerline, with a focus on reliability and ease-of-use. NETGEAR products are sold in over 29,000 retail locations around the globe, and via more than 41,000 value-added resellers. The company’s headquarters are in San Jose, Calif., with additional offices in 25 countries. NETGEAR is an ENERGY STAR partner. More information is available by visiting www.netgear.com or calling (408) 907-8000. Follow NETGEAR at http://twitter.com/NETGEAR and http://www.facebook.com/NETGEAR. Copyright 2009 NETGEAR, Inc. NETGEAR and the NETGEAR logo are trademarks or registered trademarks of NETGEAR, Inc. in the United States and/or other countries. Other brand and product names are trademarks or registered trademarks of their respective holders. Information is subject to change without notice. All rights reserved. This press release contains forward-looking statements within the meaning of the U.S. Private Securities Litigation Reform Act of 1995. Specifically, statements concerning NETGEAR’s business and the expected performance characteristics, specifications, market acceptance, market growth, specific uses, user feedback and market position of NETGEAR’s products and technology are forward-looking statements within the meaning of the Safe Harbor. These statements are based on management’s current expectations and are subject to certain risks and uncertainties, including, without limitation, the following: the actual price, performance and ease of use of NETGEAR’s products may not meet the price, performance and ease of use requirements of customers; product performance may be adversely affected by real world operating conditions; failure of products may under certain circumstances cause permanent loss of end user data; new viruses or Internet threats may develop that challenge the effectiveness of security features in NETGEAR’s products; the ability of NETGEAR to market and sell its products and technology; the impact and pricing of competing products; and the introduction of alternative technological solutions. Further information on potential risk factors that could affect NETGEAR and its business are detailed in the Company’s periodic filings with the Securities and Exchange Commission, including, but not limited to, those risks and uncertainties listed in the section entitled “Part II – Item 1A. Risk Factors,” pages 35 through 49, in the Company’s quarterly report on Form 10-Q for the fiscal second quarter ended June 28, 2009, filed with the Securities and Exchange Commission on August 6, 2009. NETGEAR undertakes no obligation to release publicly any revisions to any forward-looking statements contained herein to reflect events or circumstances after the date hereof or to reflect the occurrence of unanticipated events. The biggest problem with powerline is that they are dependent on the wiring in your house (which could be a good or bad thing). The distance between point A to point B (wiring distance), signal passing through circuit breaker, etc… can yield very inconsistent results. I had powerline set up in my house and depending on what outlets I used greatly impacted the throughput. I ultimately decided to go with good old Cat6. I would definitely recommend that anyone who gets powerline test it out right away so you can return if you don’t get the desired results. powerline is still fairly new. I think some issues they have will be worked out over time. And the issues are only under certain situations. Wireless when it was first introduced was just as unstable and flaky if not in the right situation. I do agree that you should try it out when you still have the possibility of returning it. I have 50 cat5e jacks in my house. I built the house myself so I had the luxury of buying two 1000 foot spools of it and doing the wiring. But with a finished basement with drywall ceilings I don’t have the luxury of putting additional wiring in, without cutting holes. I think it’s good to see technologies like these use existing infrastructure to work with new gadgets. If you live in a house long enough even cat6 is going to be outdated and inadequate. Have you seen any reviews comparing Powerline against MoCA (over Coax). I thought I had read when the MoCA products started hitting the market that they weren’t subject to some of the limitations as powerline (at least what I experienced). My house is only 4 years old but unfortunately when it was built we were trying to watch costs and I was still in my “tech infancy” so we only had one lonely Cat5 wire run. I just recently ran Cat6 through several rooms in the house and the basement, but for any additions in the future I hope Powerline, MoCA, or whatever the new tech is will make for an easy solution (playing back my 1080p Blu Ray mkvs is the test). This switch contains one Powerline AV Adapter with 4-port Ethernet Switch (XAV1004) and one Powerline AV Ethernet Adapter (XAV101). This “no new wires” powerline technology enables customers to carry high-speed data network traffic on their existing electrical wiring – using affordable, simple to install adapters.